Flexible fabric concrete forms allow the designer to place a hard, concrete material in locations where previously it was impossible to form concrete. The flexible fabric concrete forms can be placed on almost any surface (even underwater). The form is pumped full of a structural grout for maximum strength. Once hardened, the concrete provides permanent protection. These systems are used for erosion protection, for protection of geomembranes, and anywhere else where a hard surface is required and concrete forming is a problem. Flexible fabric concrete forms are often used for shoreline protection where the concrete layer protects the embankments from wave and wind action. 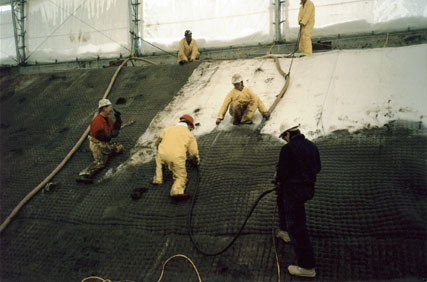 Other uses of flexible fabric concrete forms are to line channels, canals, outfalls, splash pads, and run-off ditches. Flexible fabric concrete forms are occasionally used to protect slopes from erosion, and to line the collection ditches and splash pads at the base of steep slopes.